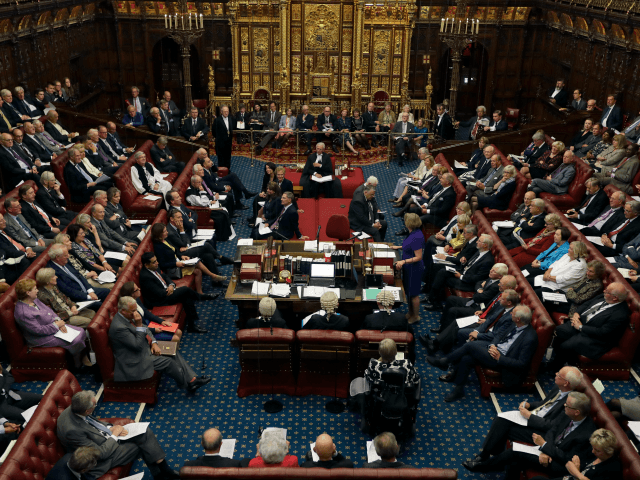 Unelected Peers have passed an amendment to the European Union (EU) withdrawal bill, which anti-Brexit politicians hope could keep the UK tied to the bloc’s Customs Union and failing trade policies. The House of Lords voted on Wednesday evening by a majority of 123 for the UK to stay locked in the union, unable to form it’s own trade deals with Commonwealth nations and emerging markets. Ministers will now be forced to report on what efforts they had made to secure a customs union by the end of October. The government, however, has argued it is only symbolic and will not hinder the Prime Minister’s promise to take the UK out of the Customs Union. The vote was tabled by crossbencher Lord Kerr and was backed by most Labour and the Liberal Democrat Peers, as well as 24 Tory rebels, including former ministers Lord Patten, Lord Heseltine and Lord Willetts. Brexit leader Nigel Farage blasted the vote as a “disgrace,” argue that Peers were out of touch with the people, and called for the house to be abolished. “All I can say is the House of Lords is stuffed full of former MPs, party donors, and former European Commissioners,” he said from Strasbourg on LBC radio. Hard-hitting home truths from Lord Forsyth: These amendments are part of a campaign that is putting Peers against the people – it's an exercise by Remainers in this House who refuse to accept the verdict of the British people. The government is expected to lose a series of votes on the Brexit withdrawal bill in coming days after Peers proposed a massive 388 amendments that could frustrate or reverse Brexit.